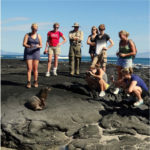 Knowmad Adventures is a company that specializes in crafting private, custom trips to South America. One of the perks of employment at Knowmad is getting to travel to and experience all of the wonders of the continent we love. Having meaningful adventures in the countries we sell travel to not only serves as personal enrichment, but also professional. Visiting the region allows us to test out the services we sell and use our up-to-date, first-hand knowledge to continue improving trips for our travelers. 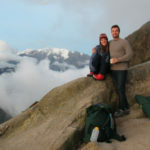 In January, our wonderful Accountant Dan and his fiancé Kelsey decided to take advantage of this unique job benefit by working remotely, living and traveling in Chile. Since their arrival, they have lived in Santiago and the coastal town of La Serena. They have also traveled throughout the country, from the Lakes District and far south to Patagonia all the way to the Atacama Desert in the north. In addition to exploring much of the central region of Chile, they also visited Argentina’s wine country. After more than 6 months of exploring, we asked Dan to sit down and tell us more about what he has discovered during his time in South America, and how his travels abroad have changed his perspective. So Dan, why did you decide to move to Chile? My fiancé and I both wanted to try living abroad and working remotely. If the expat lifestyle is something we enjoy, that’s something we wanted to know about ourselves earlier in life rather than later. We chose Chile because neither of us had been there and we wanted to see iconic places like Patagonia and the Atacama Desert. 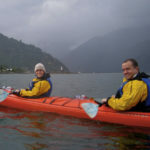 We also chose Chile for practical reasons like safety, stability and infrastructure in the hopes of making our efforts to work remotely go smoothly. My favorite thing about living in Chile is having a sense of urgency about making the most of my time. I want to see and experience as much of this new place while I’m here and so I am forced to structure my free time to maximize it. However, that doesn’t mean my free time here is always fast-paced and adventurous, but rather that my decisions about how to spend time are more deliberate because I know my time here is limited. For example, if I decide to relax for a day instead of sight-seeing, it’s because relaxation is what I’ve determined I want to do most and so I let myself fully relax. Back home, relaxation was more like a default state that occurred when I was too exhausted to do anything else. And since I found myself needing to relax but having no plans, I would end up spending my downtime on my phone or watching movies. I should have been setting time aside to relax or explore the city I live in like I do here. The sense of urgency about making the most of my time is something I want to take home with me or anywhere else I go. I don’t want my free time to occur haphazardly and be wasted on Facebook or Netflix. Have you been surprised by anything you’ve seen or experienced? I grew up in Southeast Alaska so I’ve seen my fair share of dramatic mountain formations, glaciers, lakes and wildlife. So I wasn’t prepared to be as awestruck by Patagonia’s natural beauty as I was. 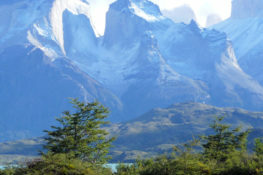 My Alaskan friends might call me a traitor for saying this, but I have never seen anything like Torres del Paine. Also, we saw wild guanacos, grey foxes, condors and a mother puma burying a guanaco that the puma had just killed. Our most recent trip was to the Atacama Desert, which also surprised me. If you know one thing about Atacama you probably know it’s the driest place on Earth. I was surprised by the variety of landscapes in a relatively small area surrounding the town of San Pedro de Atacama – many of them otherworldly like the salt flats, Rainbow Valley and Tatio Geyers. How have you gotten by with the language difference? My Spanish is poor but my fiancé’s is pretty good. I would recommend being more fluent in Spanish than I am if you are going to move here long-term. Also, if you aren’t familiar with Chilean Spanish you should be prepared to face a steeper learning curve when it comes to comprehension. Chileans speak quickly, use slang and often drop the ends of words. Fortunately, we have found most people to be willing to slow down and speak in a manner we can understand. On multiple occasions, I found myself in the middle of a conversation in Chile thinking to myself that maybe my comprehension was improving because I was understanding more than usual, only to learn that the person I was talking to was from another country like Spain, Colombia or Venezuela. Most days there are moments when a Chilean starts speaking to me in full-on Chilean Spanish before they realize I am not fluent and their words have completely eluded me. Tell me about some of your best and most interesting food experiences. While staying at Campo Aventura in the Cochamó Valley, the accommodations were extremely basic and rustic but we had a meal prepared for us on a wood stove each night. I couldn’t believe the meals the chef, Tia Anita, could create: stuffed tomatoes, fresh bread and cakes she would make for tea time. She could do so much with so little. As amazing as these dinners were, I found Tia Anita’s packed lunches to be even better for the simple reason that hunger is the best ingredient. After several hours of steep hiking, eating a cheese and avocado sandwich next to a pristine cascading waterfall or a towering mountain amphitheater can taste as good as a 5-star meal. Also, I was reluctant to try the Chilean dish Congrio (Conger Eel) because I didn’t think I would like eel but it’s really more like a white fish and is now one of my favorite meals. Humboldt Penguin National Reserve on Isla Dama, which is a couple hours north of where we are living now in La Serena. Walking to Coquimbo to check out the produce and seafood markets. Other than the weekly excursions we do relatively ordinary things on the weekends: go to a restaurant or bar, hang out with friends, hear live music, explore a new neighborhood, see a movie. If a friend was visiting you for 2 days, what would your “must-sees” and “must-dos” be? It’s probably difficult to do Patagonia in 2 days but if my visiting friend appreciates nature at all, I would take them to Torres del Paine National Park. You recently got to travel to wine country, Patagonia, and Argentina. What were some of the highlights of your trip? 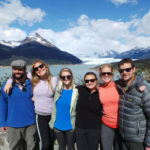 The Grey Glacier Excursion At Explora Patagonia The excursion is basically one leg of the famous “W” trek. We got boated to the start of the hike early in the morning, saw amazing sunrise views of the glacier, had a picnic on an ideal vantage point, got picked up by catamaran and drank pisco sours as we viewed the glacier up close. Cooking Class At Finca Adalgisa I dislike cooking TV shows because they just make me hungry and jealous. But imagine a cooking TV show where you get to eat the food at the end. Actually, it’s even better than that because you also get to smell the food while it’s cooking, feel the warmth of the open wood oven, drink wine made from grapes grown right outside, ask the chef questions and make merry with the other viewers. I’m relatively ignorant about cooking so don’t take my word for it; my mother-in-law is an excellent cook and it was one of the highlights of the trip for her too. I’m not going to say what we ate – it will just probably just make you hungry and jealous. Hail the Size of Golf Balls in Mendoza Normally, nobody wants bad weather on their vacation, but I like dramatic weather and will never forget seeing (and hearing) golf-ball sized hail in Mendoza, Argentina. We briefly lost electricity but it just made us even more appreciative of the fireplaces in our room at Finca Adalgisa. Well Dan, even though we’re all a little jealous, we’re so glad that you’ve had the opportunity to explore so much of Chile! 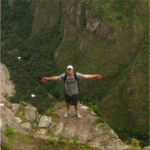 Want to know more about the highlights of South America? Give one of our Trip Specialists a call at 612-315-2894 to start planning your own adventure today!